The software RP Resonator can be used to calculate and minimize the alignment sensitivity of laser resonators. You can find out how the beam path moves for a certain misalignment of one or several resonator mirrors. The performance of a laser often deteriorates seriously when one of its components is misaligned. Typical effects are a drop of output power, a deteriorated beam quality, and increased laser noise, apart from a modified output beam position and/or direction which can affect applications. Misalignment may be caused not only by touching an optical element, but also by mechanical stress applied to the laser housing or by thermal effects. The latter can arise from temperature changes in the laboratory or from heating caused by parts of the laser itself. In high-power lasers, it may be sufficient that some small fraction of the light as transmitted by a highly reflective laser mirror hits another mirror mount, and the resulting heating causes some bending through thermal expansion. This can degrade the laser performance within a few minutes of operation. In solid-state bulk lasers, the effect of misalignment is often strongly related to a shift of the beam position in the laser resonator. This beam position can be affected by the angular position of any optical element, in particular by tilting of mirrors. Further, an effective misalignment can also result from a change in the pump beam position because this can cause some asymmetry of the thermal lens. Such an asymmetry can cause the intracavity laser beam to be deflected. The beam can also be affected by gain guiding if the gain is high. 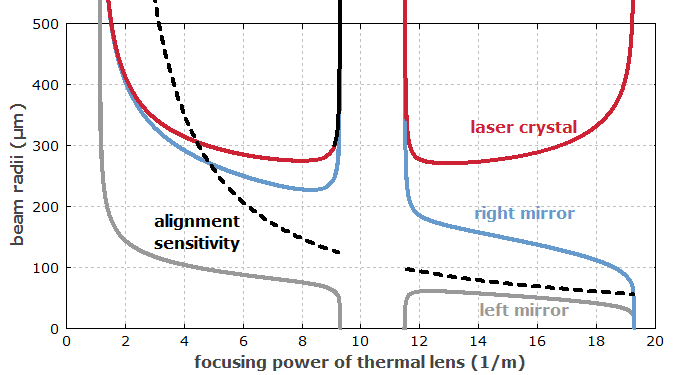 Figure 1: Stability zones of a laser resonator for variation of the thermal lens focusing power (which is proportional to the pump power). The solid lines show the beam radius at various locations, and the dashed curve shows the horizontal offset of the beam at the laser crystal when the output coupler is tilted by 1 mrad. The alignment sensitivity diverges at the left stability edge, and is much smaller in stability zone I (which is the right one in that case). The straightforward (but not necessarily the most effective) way to reduce misalignment effects is to use very precise mechanics for alignment and a very stable mechanical laser setup, including a rigid base plate which is ideally somewhat decoupled from the laser housing. It is also important, however, to know that the sensitivity of a laser resonator against misalignment can depend strongly on the detailed resonator design. In particular, for a stable resonator it depends on which stability zone is chosen: zone I according to the nomenclature of Magni  can be an order of magnitude better than zone II (see Figure 1). The alignment sensitivity does even diverge at one of the edges of zone II. Obviously, it is not advisable to operate a laser close to such a point, but this does happen since many laser resonators are designed without being aware of such issues. Finally, a painfully sensitive alignment can result from operating a poorly designed TEM00 laser in a situation where slight misalignment can cause the excitation of higher-order modes. Apart from good resonator design, carefully checking the pump intensity profile at an early stage can be a crucial measure. Resonators with a large fundamental mode area are often particularly sensitive to misalignment. In that regime, a solution with a so-called unstable resonator can be substantially more robust. Misalignment also has a dynamic aspect: mechanical vibrations of resonator mirrors can translate into beam pointing fluctuations of the output beam, and the resonator design determines how large this influence is. Therefore, design optimization for low alignment sensitivity can also contribute good beam pointing stability. There are a number of trade-offs in resonator design, e.g. between large mode sizes and low alignment sensitivity, or between zone-I operation and certain other properties. Therefore, a good resonator design requires a comprehensive treatment of all requirements in order to find a good combination of resonator properties. Although this can be a complicated task, it can be very worthwhile to engage in it because it can make a huge difference in performance. The change from a type II to a type I resonator can make the alignment much easier and allow more output power to be obtained with better stability, even if the mode size in the gain medium is not modified. It is also possible to shorten the required warm-up time of a laser by optimizing the design.